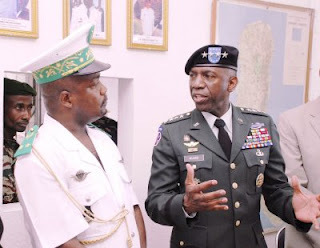 Photo: Comoran Defense Chief of Staff Salimou Mohamed Amiri (left) talks with General William E. Ward, commander of U.S. Africa Command (right), on January 21, 2009. Ward met with Comoran government officials as part of his first official visit to the island nation. Courtesy of by Kenneth Fidler, U.S. Africa Command.